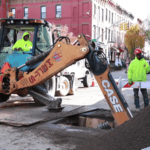 NYC homeowners experience thousands of broken water mains per year. There are many ways that a homeowner will first become aware that their water main is broken and are always questioning “how is my water main leaking out of nowhere”. 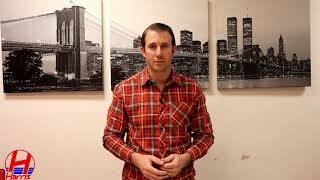 There are many reasons as to why a water line would leak, which most of are out of our control. If your house was built prior to 1960, there is a good chance it was built with a lead water main serving as the domestic water supply line. Overtime lead pipes tend to become brittle and crack, or separate at the connection to a fitting. 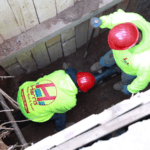 The process of replacing a lead water main is the same as replacing all other materials. 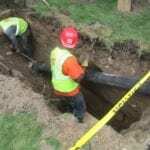 The roadway must first be opened at the point where the homeowner’s pipe connects to the city main. At this point the tap connection must be closed at the city main to stop the water from entering the private water main. Observing a sinkhole is a common way for a homeowner to first become aware that there is a problem with their water line. In this case the water main may have been leaking for months and over time has caused an undermining condition below ground. Once the surrounding soil is over-saturated, the soil will erode and eventually show in the form of a sinkhole. 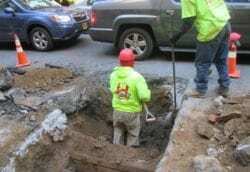 The new water main installation process remains the same, the plumber will make tunnels below ground level once the tap connection has been closed. In many cases the plumber may have to fight water with a pump before getting to the tap connection. In other cases it is another contractor which breaks the homeowner’s water line. 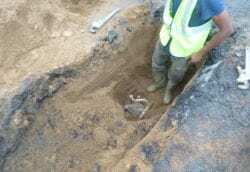 This may be due to a lack of experience or simply not being cautious when excavating. In one case a landscaper was digging on the outside of the house and hit a copper water line. The water started to pour through the foundation wall, the only way to stop the water was by opening the roadway and closing the tap connection. Because the pipe was copper, the licensed plumber was able to repair the pipe and turn the water back on in the roadway. 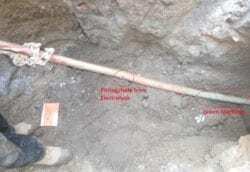 In another case there was a company test drilling on the sidewalk and was not aware of the water lines location. This contractor was not as lucky, the pipe was lead and had to be replaced in full. 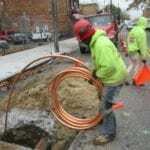 The new copper pipe was pulled from one tunnel to the next before it was pulled into the house. In most cases the actual pipe is leaking however, there are scenarios where the connection to the city main is leaking and must be replaced. In one case the threads of the tap connection had actually cracked leading to the water main leaking in the roadway. 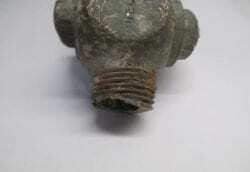 In another case the wet connection had not been utilized for many years and began spraying water from the body when attempting to close. Both scenarios require DEP to install a new connection on the city main. The water was surfacing at the curb box which is usually located within two feet of the city curb line, on the sidewalk. 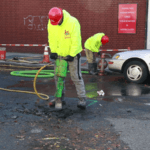 It turned out that the leak had occurred on the house side of the curb valve, this means that the contractor did not have to open the roadway and was able to stop the water by closing the curb valve. 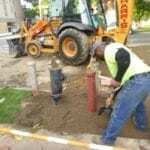 In most cases you would not attempt to make a repair to the curb valve. 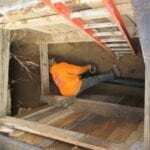 In this case the pipe was only three years old, for this reason the contractor was willing to assume some risk by excavating the sidewalk only. The curb valve was replaced and installed properly. 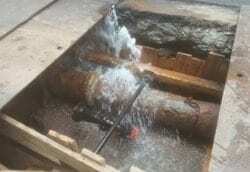 This type of water main replacement is more timely, costly and labor intensive. The roadway excavations require a lot longer to complete as well as the new piping installation. 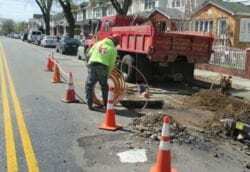 In a recent case the ductile iron water service sprung a leak that was surfacing in the roadway. Once the roadway was opened, it became apparent that the pipe had a pinhole leak that was slowly surfacing above ground level. 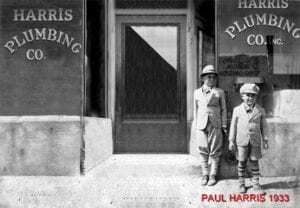 Being that the pipe was almost 35 years old, it made more sense to replace the entire pipe at once and avoid the potential of performing another repair in the years to come.